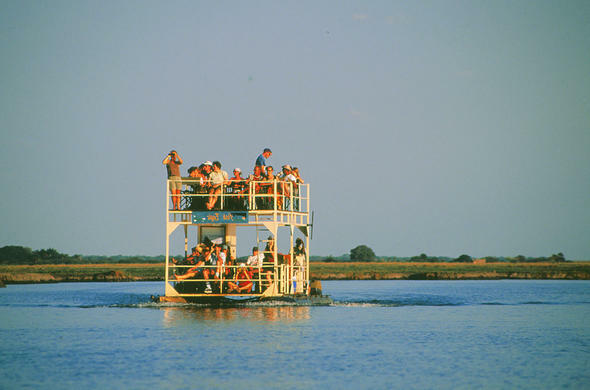 During the dry season, between April and October, the Chobe River provides a lifeline for Botswana's great Elephant herds and they travel vast distances each day across the desiccated wilderness to and from the permanent waters of the river. Watching a herd of Elephants heading to the water through the dry season landscape of Botswana's northern wilderness is one of the most abiding images of Chobe. It is not unusual to see hundreds of Elephants at any one time on the Chobe floodplains, kicking up dust or splashing in the water.Historically the Elephants moved across a wide range, with the Chobe River a mere watering place en route. The range incorporated northern Botswana, the Caprivi Strip of Namibia, south-eastern Angola, south-western Zambia and the western reaches of Zimbabwe.Civil War in Angola and a war of independence in Namibia put the herds in danger with the various armies using them as target practice and targeting them in order to sell the ivory for weapons. The Elephant sought refuge in northern Botswana and the legend of Chobe was born.With the ending of hostilities the Elephants have begun to cross the river again, although the Chobe is still the central point for the gathering of the Elephant herds in the dry season - and this is the attraction of Chobe.